Protection is now as close as your keys... For a long time the most popular non-lethal self-defense product on the market has been the keychain pepper spray. What makes it so popular is that an individual is able to defend themselves when they are most vulnerable to being attacked- when they are getting into their car. With the pepper spray attached to a key ring it is readily available without even having to think about it. This made us ask if the keychain pepper spray is so popular, why not offer a powerful keychain stun gun? The result is the Streetwise S.M.A.C.K. (Stun My Attacker Compact Keychain) 6,000,000 Stun Gun. 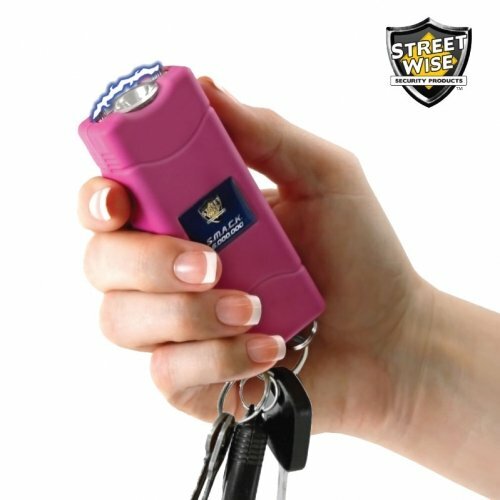 This amazing stun device is about the same size as a keychain pepper spray (measuring a mere 3.5 inches x 1.25 inches x .75 inches) and uses top quality components to give it more power than most of the stun guns on the market today. Attaches to Your Keys: When the need arises to protect yourself, you don't want to be fumbling around to find your stun gun. With it attached to your keys, you don't need to be concerned about it getting stuck at the bottom of your purse. You will have it in your hand when walking to your home or car and will be ready to protect yourself at a moment's notice. Built-In Charger: The slide-out plug on the side of the unit allows for easy charging. There are no cords to keep up with; simply plug into a standard wall outlet. Complete charging instructions enclosed Safety Switch: To prevent accidental discharge, two levels of safety have been built in. The safety switch must be in the ON position and the stun activation button must be pressed before the stun gun will operate.